With each album release Meg Bowles discloses more depth and complexity. 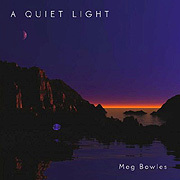 The CD A Quiet Light (64'13") creates an aural realm alluringly suspended between heaven, earth and space. A wonderful interplay of contrasting harmonies, gentle textures and a most benevolent bearing, this work has its own natural almost tidal rhythm. The mesmerizing swirl of synthesized tones bestows a dreamy inwardness upon the listener. Moments of shear musical power may be felt within the sonic sheen of ethereal voices, warm strings and breathing waves of muted electronic forms. There is a delicacy to this music that gives it a measure of beauty very rare in the field of Electronic Music. From its long sustaining tones, to the quiet patterned pulsing of bleeping notes, and the slow reveal of each dark passage - A Quiet Light rings with the truth of deep human feelings. Bowles' music conjures space, light and a sense of scale - and has evolved beyond its obvious influences. With an ear for consonant sonorities and a practiced sense of composition, Bowles creates a vivid and emotional musical experience.